“The biggest threats, today, for the country is corruption. The countrymen should rise and fight against corruption at all levels, rather than shedding blood and indulging in violence for the reservation. The reservation has only played the role of an amoeboid monster sowing seeds of discord amongst the people. The importance of merit, in any society, cannot be understated”, Justice Pardiwala said. 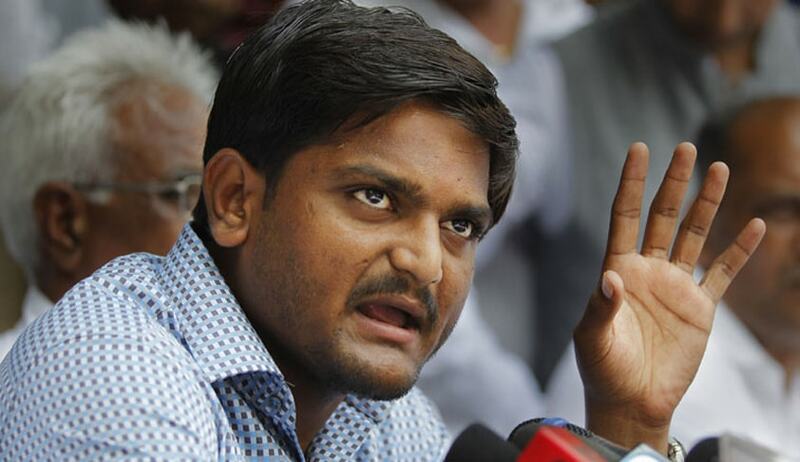 Gujarat High Court has quashed FIR lodged against Patidar Anamat Andolan Samiti (PAAS) convener Hardik Patel and others pertaining to charge that they were involved in an act of Treason (Waging war against the nation Section 121 IPC). The court, however, has allowed the investigation against the agitators to continue so far as the sedition cases against them is concerned. Justice JB Pardiwala, quashing the Treason case, said that an organized movement attended with violence while agitating for the inclusion of the Patidar / Patel Community in the list of the OBCs should not be viewed as an act of treason in the form of levying war. There was no insurrection to attract offence of Treason. A riot is a disturbance. An insurrection is a revolt or rebellion against the government. A riot is a noisy, violent public disorder caused by a group or crowd of persons, as by a crowd protesting against another group, a government policy, etc., in the streets. An insurrection is an act or instance of rising in revolt, rebellion, or resistance against the civil authority or an established government. An insurrection is more organized resistance, while a riot is chaos. A riot is a chaotic, spur of the moment occasion, where people who are angry over whatever reason suddenly turn violent. An insurrection is a revolt against an institution or a government, with a purpose, and usually better planning. Riots are short in duration, and usually localized. Insurrections are long term civil disobedience, and are generally spread out among the populace. The court said that intention and purpose behind the agitation is to include the Patidar / Patel Community in the list of the OBCs. Referring to Apex court decision in State (N.C.T. Of Delhi) vs Navjot Sandhu@ Afsan Guru , the court said that if it is found that the object sought to be attained is of a general public nature or has a political colour, the offensive violent act targeted against the armed force and public officials should not be branded as acts of waging war. Interestingly, Justice Pardiwala also made some comments regarding the issue of reservation. He said that Reservation and Corruption has destroyed this country and has not allowed the country, to progress in the right direction and it is very shameful for any citizen of this country to ask for reservation after 65 years of independence. When our Constitution was framed, it was understood that the reservation would remain for a period of 10 years, but unfortunately, it has continued even after 65 years of independence. The parody of the situation is that India must be the only country wherein some of the citizens crave to be called backward, the Judge opined. The court further opined “The biggest threats, today, for the country is corruption. The countrymen should rise and fight against corruption at all levels, rather than shedding blood and indulging in violence for the reservation. The reservation has only played the role of an amoeboid monster sowing seeds of discord amongst the people. The importance of merit, in any society, cannot be understated”. Of course, quite another matter that his views on reservations were completely irrelevant to the matter at hand!! In an earlier judgment, High Court had quashed the FIR against Hardik Patel so far as it relates the offences under Section 153A, 505(2) and 506. The Court also had directed the police to proceed with the investigation on allegation of Sedition [S.124A] since a prima facie Case is made out against him.